Found any fun new blogs lately? Started one yourself? Stumbled on (or written) something you think our Passionate Users regulars might find interesting... but that wasn't on-topic enough to put in a comment? Wanted to do a shameless self-promotion trackback that had nothing to do with the post, without appearing shameless? Now's the chance. 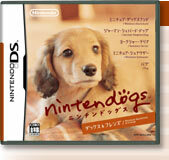 1) I've been wanting to talk about Nintendogs even since I got back from Japan, but didn't get around to it. 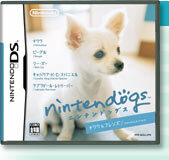 I'm still planning to do something on girls and video games, inspired by Nintendo's marketing of this game in Japan, but yesterday I found a wonderfully (long and detailed) review of the design of the Nintendogs game, that's got some great stuff even if you're not a game designer. (We should all be thinking like game designers) Read it on the Lost Garden blog (which I found via the Greenonions blog). Hi, I have been loving your site for a while. Your "How to Create a Nonfiction BestSeller" and "Is Your Book Remarkable At Every Scale." really inspired me to finish and improve what I started. As an engineer I have found the vast majority of people totally lacking in math skills and not caring about it in general. I wrote the first book in a series to teach mothers how to teach their children numbers and counting. The rest of arithmetic will be covered in the subsequent books. I want to thank you for your ideas and inspiration. Would you like a free copy of the counting book? Just email me. I am a fairly new visitor to your site. I find your entries to be helpful and interesting. Kinetic Ideas provides interesting and fun tips, ideas, strategies, and anecdotes related to marketing and promotions to help your business succeed! Wish I had something to promote shamelessly here for myself, but I'm getting married in a month and have been otherise occupied. Skip the two most recent posts, and you'll get into some really good meat about community-driven technology (wikis, etc.) and how shared, open information can benefit both businesses and their customers. Jonathan's a passionate advocate of the Internet as it should be, an extremely well-versed techophile, and (here's the clincher) a really great writer. Thanks for your site- I forwarded to everybody in my department your treatise on the dangers of PowerPoint. I truly think you saved lives. I recently started a site called CafeGeek. The goal is to build an online community of cafe and coffee lovers. Coffee drinkers are passionate, and to the best of my knowledge until now there has not been community based site for reviewing cafes. Soon to come will be competitions, interviews (text and podcast) with featured reviewers and baristi, and a community newsgroup. First, love the site. Long time lurker, first time commenter. I've recently launched a new business called The Blog Studio (www.theblogstudio.com). We are design oriented blog-mad writers, web designers and marketing dudes (no dudette yet, but I'm working on it). We're running a launch special, so if you know anyone who wants a business blog that is going to really make a mark, please send 'em our way. Steps along the journey to living a simple life in today's world. No, this doesn't mean we grow our own vegetables or make our own opossum cheese -- it's about simplifying the millions of choices and decisions we have to make every day. Hopefully pointing out some of the more mundane ones and ways to remove them from your brain. Afterall the brainpower you save, could be your own. Thanks for allowing me to post. I really love this site...it has helped me tremendously in my quest to build a little business into a bigger one. The nonprofit I work for, Free the Slaves, is dedicated to eradicating modern slavery around the world--27 million people are slaves today, including some 10,000 slaves in the United States. We've just set up a blog on our site, and I'd love to hear any feedback on it from your site's visitors. I love your blog - it's full of great thoughts. Thanks. First I would like to say that Head First Design Patterns is incredible and I look forward to reading more Head First books. I just started reading this blog and will become a regular due to the content being so great. The dangers of too much blogging and de-evolving your own blog. Thank you for the opportunity! The site that I'm passionate about is http://www.winforme.com. WinForMe.com is a site that helps members enter online sweepstakes quickly and easily. It's a fun site and has helped many of our customers to win. I've been enjoying your blog's tips on how to instill our customers with the same passion that I have for the site and for the work we do. ...no cute video of YOU jumping up onto your horse? I really enjoy your writings and thoughts. Thanks, keep up the great work. jim. Hmmm...My idea to Blog was more of the urge(as is to my observation every other blogger) that you just can't keep locked up. So you unlock it and set it free. Kathy talks about wonderful thing, and I've taken a bit of liking to her book and will be hanging around here more often. OK so my blog http://tarrysingh.blogspot.com is more about what I think (and strongly believe) what the world has been and what it will be because of what it has been. I am massively enjoying writing my poems again (it has been a while since I did that.). But more importantly I've found the direction and now it's time to march. The poems will/may reflect some of that thought. But you can also read and just enjoy reading them. Thanks for all the great articles. My girlfriend is writing a small home-grown technical manual for a niche software product she uses (and is passionate about), and when I recommended your site to her, she printed out about 40 pages worth of articles to pore over. I will be referring to this site often if I ever get my own software dreams going, but for now you still provide valuable lessons that apply to life in general. Great work! My relatively new blog is Human Advancement. It's about how the human race can advance in the areas of Life, Intelligence, Technology, and Freedom. I've had Creating Passionate Users on my blogroll from day one because of the things you guys have to say about learning and about motivating the people around us - both vital to Advancement as I see it. If you have nothing better to do (and who has? ), please check out my highly opinionated and occasionally enlightening "PeaceLove's Musings" blog, which I have subtitled "Random musings on the Sacred Geometry of the Web, Technology and Pop Culture, Psychedelia, Global Transformation, and the End of Everything." I'd appreciate any feedback. Thanks! Now you've got passionate users - so what's your problem? You're enormously busy. You need to know more and have no time. Business, science, culture, art, and sports - sifted for entrepreneurs. I'd like to point out a blog that connects to The Mental Fitness Center. Stretched your mind lately ? If not, go to the blog and the site that links to my name. My wife's writings will challenge you, entertain you and hopefully, help you get better. Thanks for a great blog and this chance to yell out our name. No shameless plug here, just some kudos to Head First Gang. I'm a new visitor to the site after picking up a copy of Head First Design Patterns (should y'all be called the "New GoF"?). I have throughly enjoyed your book so far even though I'm a C/C++ developer! I'm almost want to get a copy of Head First Java;-) Your whole method of empowering the learner has moved me to totally rethink the beginning C++ class I teach at a small university! It's got me pumped really! When are you going to do a Head First book on C++ and Design Patterns in C++?? All About Users (http://allaboutusers.blogspot.com/), is a blog about user experience and interaction, something that I am passionate about. Some of the entries are about software but I do write about everyday stuff as well. Thanks for the opportunity Kathy. I'm in Japan and recently I've started a site/blog giving away cool little things from Japan. It's called Free Stuff From Japan, and it's not a pyramid scheme just a simple draw (spam-free I promise). I am glad to have this chance to do a shameless plug because I have been having difficulty getting word out further than 2 degrees (i.e. friends, and friends of friends) so if anyone else thinks it is worthy or cool please link to us. Comments and feedback are also welcome. I hope you enter Kathy, thanks for an excellent blog. Kathy, I've been reading your weblog for a few months now, and I try to incorporate as much of what you advocate as I can in both my workplace and on the web sites I curate. At least in a small way, reading Creating Passionate Users helped our site to be Yahoo's Pick of the Day last Friday: http://www.ubcbotanicalgarden.org/potd/ (Botany Photo of the Day).